This dessert is easier than it looks using prepared pie crust. The smaller Forelle pear works well in this elegant dessert presentation. Preheat oven to 350 degrees. Core pears, leaving stem intact. Mix dates (or dried fruits), brown sugar, and cinnamon. Fill cavity of pears with fruit mixture. Roll out pie crust (or use prepared crust). 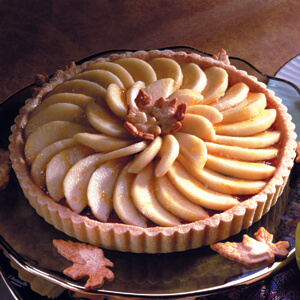 Cut 2 strips of pastry, 2 inches wide by 8 inches long, for each pear. Cut the end of each strip so it tapers to a point. For each pear, lay two strips of dough together in the shape of a cross. Moisten center of bottom strip with water before placing other piece on top. Place filled pear in center of cross. Brush edges of dough with enough water to moisten. 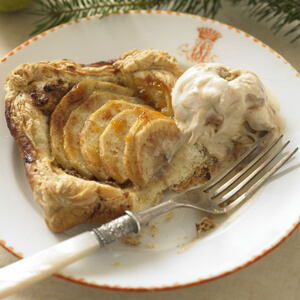 Gently fold dough up the sides of pear, and pinch edges together. Repeat with other edges and pinch tops together to seal pears completely. Beat egg and milk together. Brush dough surface with mix. Bake on cookie sheet at 350 degrees for 25 to 30 minutes, until golden brown. Cool on rack. Mix sour cream, sugar, and vanilla. Place ⅙ of mixture on each dessert plate; dot with berry syrup. Swirl pattern with knife point. Place pears on plate and serve.